Sometimes, it really does make sense to pause and examine the writing on the wall. While visiting music television channel MTV’s vibrant Parel office in Mumbai, I get some compelling insights into workplace design from an unexpected source: the walls. This experience is echoed when I visit the Kalina, Mumbai, offices of Komli Media, an online advertising network founded in 2006 by Harvard computer science postgraduate Amar Goel. Both companies are cut from the same cloth: They operate at the intersection of creativity, media, technology and youth. Komli Media serves as a digital media technology platform for Web publishers and advertisers. An iconic channel, MTV has morphed into a definitive youth brand, beaming across live events, mobile phones, the Internet and social media. The employee demographics of both companies are similar—an aspirational, energetic, tech-savvy and globally minded workforce, largely in its 20s. I am meeting their business heads, Aditya Swamy of MTV and Amar Goel of Komli Media, to get answers to something that has been intriguing me for some time: How does one successfully design a workplace for Generation Y? And how do the 30-something CEOs of such companies operate in such environments? Are they cocooned from the rest of the office or fully integrated in the trenches? Part of the answer, it seems, lies in the walls. At Komli, the walls are truly writable. Made of toughened glass and coated with a white film, all the walls of the company’s numerous meeting rooms are filled with scribbles. “In tech, it’s kind of a cultural thing because engineers and product people want to write on whiteboards," explains Goel, 35, chairman of Komli Media. Instead of conventional whiteboards, Goel and his colleagues preferred glass as a material, as it maximizes natural light penetration into other parts of the office. At MTV, the walls (and cabinets) are dynamic, and branded. They are plastered with large vinyl stickers displaying MTV’s latest brand identity: Stay Raw. Swamy, 37, channel head, explains that since the brand adopts a new tag line every few years, vinyl stickers are the most effective way of updating the workplace without having to make major structural alterations. While the walls, and vertical surfaces, of any “youthful" office are always quite lively, at both Komli and MTV they evidently play a visible role in reinforcing company culture. Speaking to both business heads, one important similarity emerges. For these two CEOs, the notions of “personal space" and “public space" are almost interchangeable. Unlike most CEOs of an older generation, Goel and Swamy are comfortable working in different parts of the office, alongside other team members, apart from their officially assigned spots. As a result, they relate strongly to the needs of their junior colleagues, and the design of the entire office is as relevant to their way of working as their private spaces. The first point emphasized by both Swamy and Goel is the need to be collaborative in approach. Generation Y workers are more likely to question their bosses. Says Swamy, “You’ve got to give team members logic and convince them, it’s not just ‘hey, I’m telling you it won’t work’." As a result, offices must be physically open-plan, so as to maximize communication between colleagues. At MTV, only the heads of the three channels (MTV, VH1 and Nickelodeon), and the company head of Viacom18, have cabins. At Komli, no one has cabins, everyone has similar-sized workstations. Goel is seated adjacent to Komli’s CEO, Prashant Mehta, separated by a low partition. 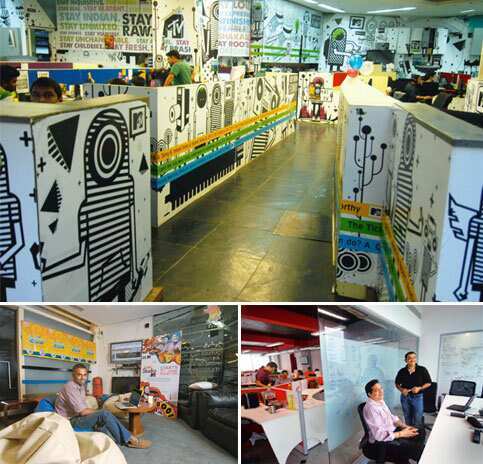 Both Goel and Mehta eschewed private offices when designing Komli’s office fitout. Large, individual cabins were not “justifiable" for a company of Komli’s size, explains Goel. Natural light, better ventilation, adequate desk space and more meeting rooms were bigger priorities, he adds. For discussions there are 17 meeting rooms of various dimensions—a huge number, given that the entire office accommodates 180 people. Each floor has three meeting rooms, meant for internal team meetings. Apart from these, an entire floor is dedicated to meeting and conference rooms, some of which are larger and equipped for video, Web and phone conferencing. As a “global start-up" with offices in 12 locations across the world, virtual collaboration is a business necessity for Komli. “Because we’re spread across a lot of geographies, people are always on the phone with other people, and always trying to connect, there’s a lot of team stuff," says Goel, who himself shuttles between meeting rooms throughout the day. The personal desks of both Swamy and Goel sport a similar, paperless, uncluttered look. This is as much the outcome of technology as a faster pace of work. “It’s all about taking action, fast, the whole style of long monthly review meetings is not my style," says Swamy. Similarly, for Goel, writing notes on the walls comes more naturally than accumulating stacks of paper. For both, their personal workspaces appear to have functional, rather than emotional, connotations. Swamy’s office bares little traces of personalization, apart from a collection of “access cards" to MTV events, which he saves as memorabilia, and a few MTV branded items. Goel’s desk is similarly bare. As expected, the spatial metaphor of the “college canteen" travels seamlessly to both offices, in the form of beanbags, informal lounges and recreational amenities like a pool table or table-tennis table. Both Goel and Swamy are comfortable in the casual environment—in fact, the beanbag in Swamy’s cabin was one of the first additions when he moved into the space. Equally, both are quick to highlight that while the offices might appear casual, it doesn’t imply that people don’t work hard. “Nobody cribs about working 24 hours a day, four-five days in a row. They sleep here, we have showers and bunk beds," testifies Swamy. Recreational amenities are thus seen as legitimate pay-offs for consistently long hours. Gadgetry and technology, in the form of laptops, smartphones and the Internet, are vital in Generation Y offices. “Most of our people live and breathe with their computer. They take it to meetings, to presentations, they take it home, they take it on vacations. This is not their work computer, it’s their life computer," Goel emphasizes. Both meeting rooms and workstations need to be wired for multiple technological gadgets. Swamy’s need to stay current with media and music is evident in the three flat-screen televisions and impressive music system in his cabin. When designing workplaces for a younger workforce, clients and designers are usually fixated on bright colours and beanbags. Swamy and Goel’s spaces and workstyles reveal that surface treatment is just part of the “youthful office" story. The speed of decision making, openness, informality and technology are equally, if not more, important criteria. Aparna Piramal Raje, a director of BP Ergo, meets heads of organizations every month to investigate the connections between their workspaces and working styles.